With more anti-idle laws enacted across the country and the increasing power demands of truck accessories that drivers want, you need a battery that can stand up to the challenge. Exide knows the punishing demands of today’s commercial/heavy duty vehicles and has your answer — Exide RoadForce AGM 200. The RoadForce AGM 200 has 2X better cycling and 40% greater charge acceptance when compared to conventional flooded batteries, for more power when you need it most. And 14X more vibration resistance than conventional flooded batteries means superior durability. Continuing the tradition of higher standards, RoadForce is backed by over 100 years of innovation and a strong nationwide warranty program. Active material supported by AGM separators allows for improved cyclability over flooded product - at least 2X greater cycling ability at moderate discharge levels (SAE j2185) and 3.4X greater cycling ability at deep discharge levels. 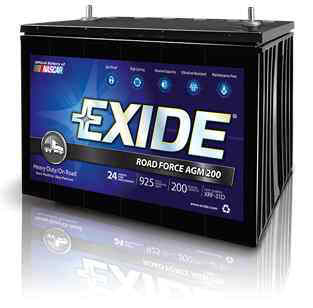 Exide's Roadforce AGM200 is built to keep truckers going, even when they're not on the road. The current no-idle laws restrict truckers from running their engines to power their overnight comforts. From microwaves to DVD players, Exide's 200-minute reserve capacity (RC) will keep your equipment running longer. Rigid element compression and cushioning by AGM separators allow for over 14X the vibration protection compared to the conventional products. Designed for maintenance free performance. Low impedance design allows for 40% greater charge acceptance rates over a flooded design, allowing quicker recharge capability. Low shelf discharge rates allow for 60% greater shelf life than flooded types. Over the top handle allows for easy installation and folds out of the way after installation.